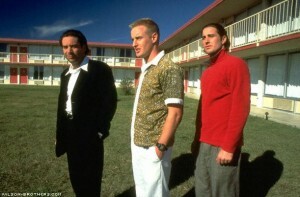 When I was studying film I remember Bottle Rocket was the first movie that made filmmaking seem tangible. I could tell these guys were just like me from the story they told and the way they told it. Wes Anderson and the Wilsons not only brought their chatty slacker melo-drama to life but it looked beautiful too. This was one I had to have letterboxed on laser disc before the dvd revolution came along. The music in Bottle Rocket was just as memorable as the jumpsuits, plucky and upbeat like the sun rising over the Texas farms in the background. Mark Mothersbaugh layed down the Spanish sounding and jazzy pieces while the Stones cap off the final “action” scene with 2000 Man; but my favorite cue is the non-diegetic to diegetic trick with the Promclaimers “It’s Over and Done With” after Dignan and Anthony fall out cutting to Inez upset and killing the music by powering down the boom box. Here’s a gem I found on youtube that I want to share with Mark Mothersbaugh breaking down his scoring career from the beginning and why he took to Wes Anderson’s love of filmmaking; from Bottle Rocket through the Life Aquatic. He discusses in detail that Wes didn’t like any low bass tones in the score which becomes a running theme through the first 3 movies. Lots of acoustic guitars, sleigh bells, shakers and flutes but you won’t hear a trombone until Royal Tenenbaum’s family hit the screen. Bottle Rocket is a risk from script to screen, but the music like the colorful imagery generates an added enjoyment to the simplest scenes. A stroll on a hotel housekeeping shift with Anthony and Inez is brought to life with Mothersbaugh’s arrangements. It lends a subliminal credibility that musn’t go unnoticed by anyone trying to make a feature. Bottle Rocket delivers on the other elements to maintain that credibility but a movie takes time to unfold before a viewer “buys it”. Music on the other hand can lead to a fan or a hater in just a few bars. I was too young to appreciate Devo in their time…but Mr. Mothersbaugh caught me at just the right time with this project. First is the band Love’s classic ode to sentiment of the same name with “Alone Again or”. Next is the Stones “2000 Man”, sorry about the sound of the jump rope but once you recognize the tune I dare you to click full screen and see the fat man jump! The Proclaimers made their mark in Benny and Joon and were a huge success with Shrek but this placement of the Scottish twins in a Texas setting was only inspired. And last but not least the song from Zorro ‘74 that you’d think the Proclaimers would sound good covering. Great article! Impressive! Makes me want to take in the movie and enjoy the music. Music is so vital to a film. I can’t imagine this or ‘Almost Famous’ or ‘Casino’ without the tunes. As for composing, Mothersbaugh is one of the best for the more low-key, creeps-up-on-you film scores. On the money.